Tenuto is a collection of 24 highly-customizable exercises designed to enhance your musicality. From recognizing chords on a keyboard to identifying intervals by ear, it has an exercise for you. Tenuto also includes six musical calculators for accidentals, intervals, scales, chords, analysis symbols, and twelve-tone matrices. A short description of the exercises and calculators follows. For a full list of all available customizations, visit the "Developer Website" link on this page or open http://tenuto.link/features/ in your web browser. –––––– • Note Identification • Key Signature Identification • Interval Identification • Scale Identification • Chord Identification Tap the button corresponding to the written staff line. 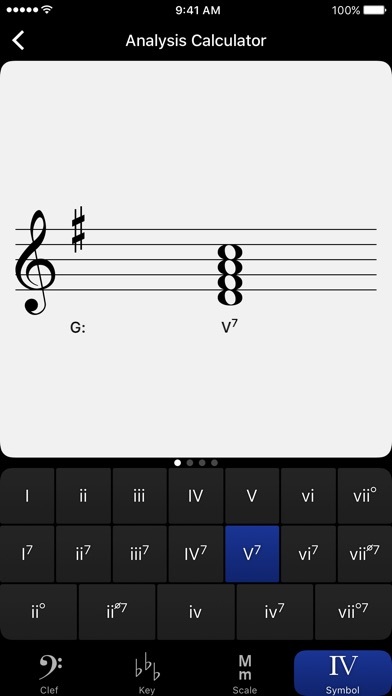 For example: if shown a C, E, and G with a sharp; tap the "Augmented Triad" button. –––––– • Note Construction • Key Signature Construction • Interval Construction • Scale Construction • Chord Construction Construct the specified label by moving notes and/or adding accidentals. 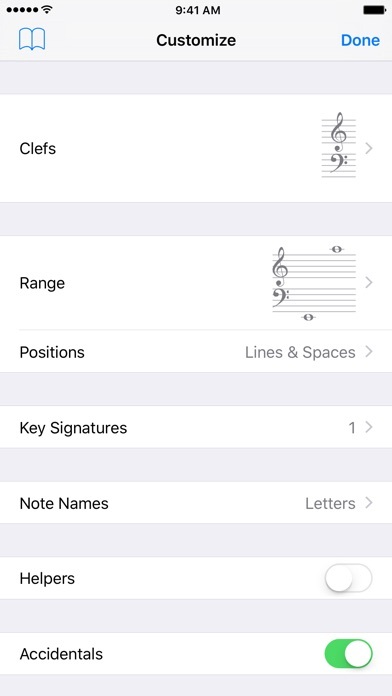 For example: if shown a C and an "Augmented 4th" label, move the second note to F and add a sharp. –––––– • Keyboard Reverse Identification Tap the piano key corresponding to the written note on the staff. While similar to Note Identification, this exercise uses a piano keyboard rather than note name buttons. • Keyboard Note Identification • Keyboard Interval Identification • Keyboard Scale Identification • Keyboard Chord Identification Tap the button corresponding to the highlighted piano key(s). If the C and G keys are highlighted, tap the "P5" (Perfect 5th) button. –––––– • Fretboard Note Identification • Fretboard Interval Identification • Fretboard Scale Identification • Fretboard Chord Identification Tap the button corresponding to the marked fretboard position(s). If the 2nd fret of the D string is marked, tap the "E" button. –––––– • Keyboard Ear Training • Note Ear Training Listen to the played reference and question notes. Select the piano key or note button corresponding to the question note. • Interval Ear Training • Scale Ear Training • Chord Ear Training Tap the button corresponding to the played notes. If E and F are played, tap the "Minor 2nd" button. –––––– • Accidental Calculator Display the accidental for a note and key. • Interval Calculator Display the interval for a note, type, and key. • Chord Calculator Display the scale for a tonic and scale type. 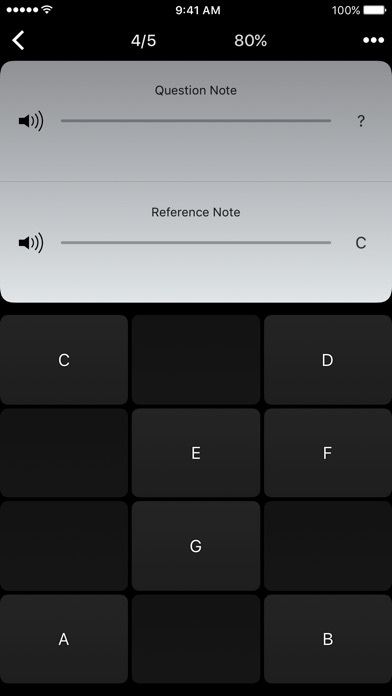 • Chord Calculator Display the chord for a note, type, and key. • Analysis Calculator Display the chord for a symbol and key. • Matrix Calculator Display the twelve-tone matrix for a specified tone row. This is a terrific interactive learning tool for music theory. I use it to test what I learn in its companion app, Theory. Highly recommended. I am a beginner music theory student. 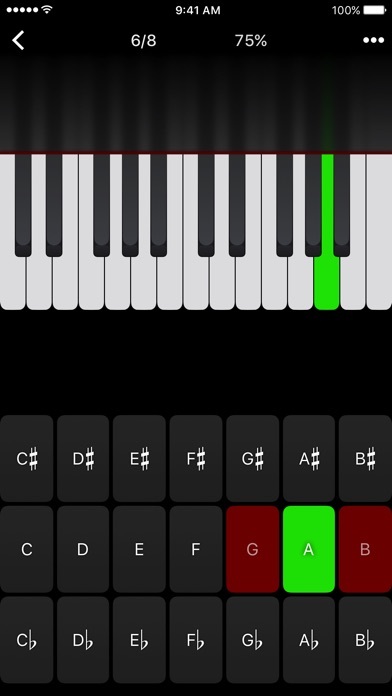 From my experience, this app can be used for beginners on to practice theory learned elsewhere. It does not include theory lessons but instead contains many different kinds of customizable testing and practice tools. Some of the tools are not configured for beginners, (or perhaps simply not configured is a better description), and can be overwhelming if you just start using them out of the box. You can simply change the parameters to fit your skill level. There are a number of different tools for practicing notation reading, keyboard and fretboard identification, ear training, and more. For me as a self study music theory student this is really an excellent tool, which I imagine will remain useful as I continue to get more and more advanced. My thanks to the developers for being so thoughtful, this is a really helpful app for me and I expect one of the best practice tools for music theory learners. I have dozens of music apps on my phone. By far, this is the one I open and use the most. It offers so many things and the look, layout and design is wonderful! It’s Easy to use and intuitive. 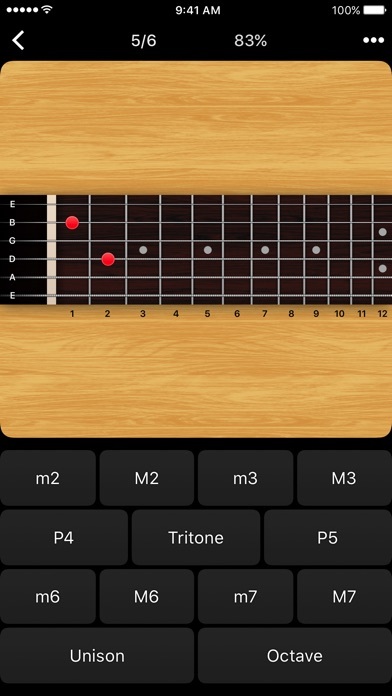 I’m a guitar player and the hours I’ve spent doing fretboard exercises alone has made this app priceless to me. I credit this app with helping me finally memorize the notes on the fretboard. Thanks to the developers. Keep up the great work! I can’t tell you how many hours I’ve wasted playing Sudoku or other games while idle. Not any more! I started taking beginner piano and voice college classes last semester and, while continuing those this semester decided to add music theory where that teacher has us going to the Musictheory.net web site for supplemental lessons and practices. That site is so fabulous and valuable for my music studies that I decided to add the paid apps to my iPhone. Now, instead of wasting time in some game when idle, I open Tenuto for worthwhile brain-teasing in challenge mode. Carnegie Hall, here I come! This app is impressive. I absolutely love how customizable it is, as my motivation was interval ear training. Since I am just beginning I can pare down how many intervals it questions me on, so I can get major third, perfect fifth, and octaves, later I'll add in perfect fourths etc. I've found that other apps and websites have an all-in approach that I can't imagine making any progress with. The customization also lets you choose to hear the interval (in an impressive number of instrumental timbres) again after you've selected the correct answer in an almost spelling bee like format: major third (plays interval) major third. And I haven't even mentioned yet that this app also has exercises relating notes on the staff to keyboard and guitar fretboards, key signature recognition, chord recognition... Easily the greatest value I've found in terms price to sheer amount of practice and information. Thank you musictheory.net! If you’re a musician, this is the app. It’s got all the stuff, well laid out and elegantly functional. Picked up intervals very quickly using this app daily. That alone was more than worth it but the app offers a host of other features. Take a more contemporary angle?